First I would like to let everyone know that this post is personal and off-topic from my other posts. 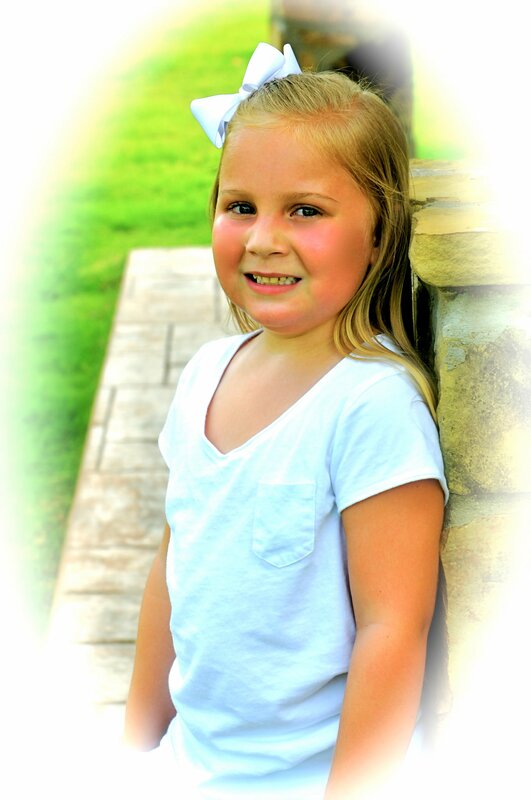 My precious daughter Clara, who is 5 1/2 years old, was diagnosed with Juvenile Dermatomyosits, called “JM”, at the end of December 2010. JM is a very rare but life threatening disease when not kept under control. Fortunately for us, Clara is doing great and her progress is literally years ahead of what the doctors expected, and it is truly a miracle from God. Because of the rarity of this disease, however, it does not get a lot of attention and consequently there is not a lot of grant money available to fund research to find a cure for JM. When our family first learned about Clara’s diagnosis it was very traumatic and was a shock to us all. Thankfully we were able to get her in to the Texas Scottish Rite Hospital for Children where the wonderful people there took amazing care of her (and us) and have taken care of her treatments every since. The people at Scottish Rite have been unbelievable and we owe everything to them. They also introduced us to Cure JM. We were very blessed to have the emotional and informational support group of the Cure JM Foundation which is the organization that is taking the lead on trying to find a cure for JM. As a way of saying “thank you” for the help, and to try and help raise funds to find a cure for this obscure disease, Clara’s mother has worked very hard to organize a golf tournament, the proceeds from which will go to the Cure JM Foundation. 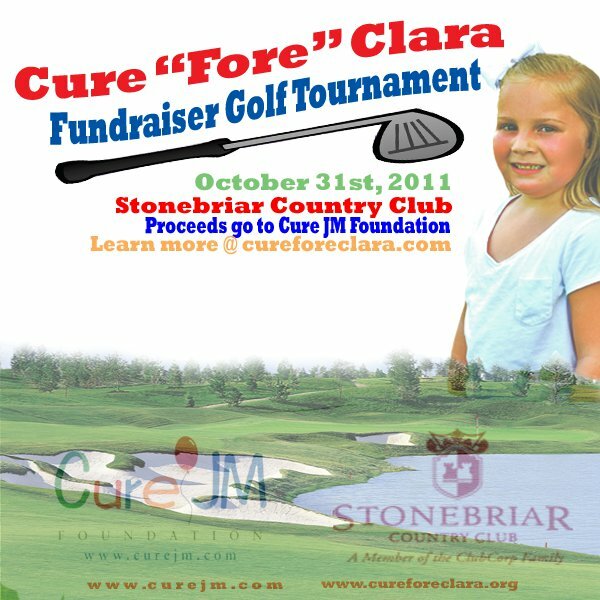 The tournament is called “Cure Fore Clara” and even has its own website that explains more about Clara’s treatments, the disease in general, and the details of the golf tournament! The tournament will be held at 9:00 a.m. on October 31, 2011 at the Stonebriar Country Club in Frisco, Texas. Spots to play are still available and this will make a great positive way to spend Halloween day! For more details click on the Cure Fore Clara website. There is also a Facebook Page (Cure for Clara) that I would ask everyone to go and “Like” — Clara loves seeing that she has more “Likes” than Daddy (she just rubbed it in again this morning!). The flyer for the golf tournament is set out below. I want to give a great big shout-out to my 13 year old son Andrew and his friends for designing this flyer all on their own — GREAT JOB BOYS! Finally, I want to also make sure that everyone knows the purpose of the Cure Fore Clara tournament, while named in Clara’s honor, is to benefit Cure JM. I have absolutely no financial interest in any proceeds from the tournament — it’s for a far more important reason — to Cure JM! Thank you!!! Next Post Is a $5k loss required for each defendant under Computer Fraud and Abuse Act? Shawn – what a touching blog entry! Clara is beautiful and she’s a fighter! Thank you so much Bhaveeni, she is my little angel — thank you! And yes, she is a little fighter for sure – she has shown so much courage and strength through this, when all of the rest of us are weak and scared she just puts a smile on her little face and marches right in there for her “pokes” (shots, iv’s, etc) without missing a beat – we have all grown so much through this and thank God for her and our other children each and every day!